Have you heard of the brand Hax before? They basically take whatever the latest Instagram makeup craze is and make it easy to recreate with one of their kits! Ombré lips/holographic lips/cut crease? They've got you covered! I love the look of a cut crease eye as it's pretty bold and dramatic so I was delighted to receive their Glitter Cut Crease Kit to try! 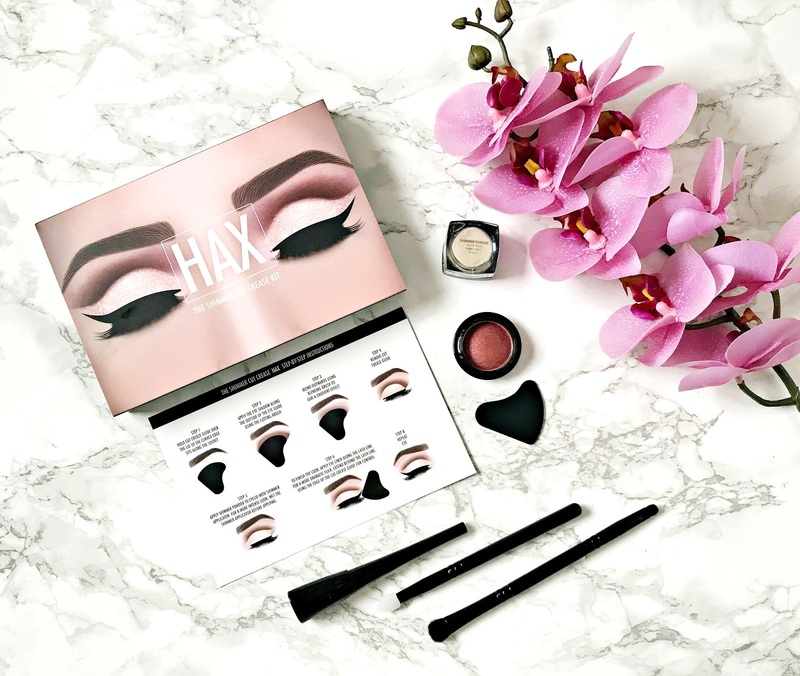 Inside the kit is everything needed to create the look: a base shadow, a glitter, a lid guard, two eyeshadow brushes and a liquid liner. There is also a step by step guide to creating the perfect cut crease. If you aren't aware of what a cut crease is, it is essentially where you use a deep shadow in the crease of your eye and a light shadow on the mobile lid. It can be quite tricky to achieve a clean contrast between the two, but the little lid guard makes it so easy. With this kit, you place the guard on the lid so that the curved edge is against your socket, then you apply the burgundy shadow along the outside of the guard and blend upwards. The shadow provided is buttery soft and very pigmented, making it very easy to use. You then remove the guard and press the shimmer (loose pigment) onto the mobile lid with the applicator provided in the box. The next step is the liquid liner, which intensifies the dramatic effect of the look. If you are not used to applying liquid liner, you could turn the lid guard on its side and use that as a guide to create your flick. Then a slick of mascara or some falsies and you are done! This kit really does make the process very quick and easy and at £19.99, it's pretty good value! Available from ASOS. Are you a fan of the cut crease look? All products are bought by me, unless otherwise stated. This was kindly sent to me. Opinion is always my own.